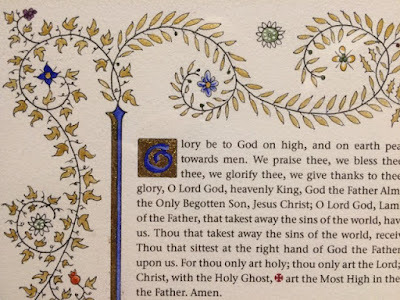 Following the promulgation of Divine Worship: The Missal on the First Sunday of Advent 2015, the communities of the personal ordinariates in the United States and Canada, England and Wales, and Australia, have been adjusting to the texts and ceremonies of the new missal, which draws from the tradition of the Book of Common Prayer, and the Anglican missals of the early to mid twentieth century. 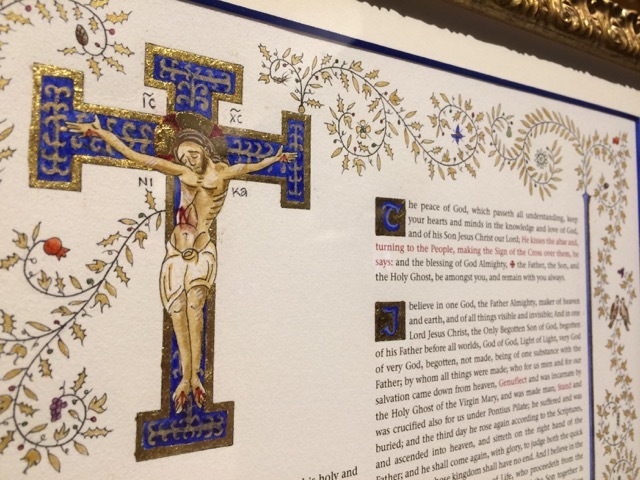 As the liturgical life of the ordinariates begins now to develop and to flourish, communities and their clergy will no doubt wish to commission works of art to accompany their worship. Examples of this have already been seen with a chalice and paten, commissioned by Saint Gregory the Great in Beverly Farms, MA [http://www.newliturgicalmovement.org/2013/09/photos-of-completed-chalice-and-paten.html]. 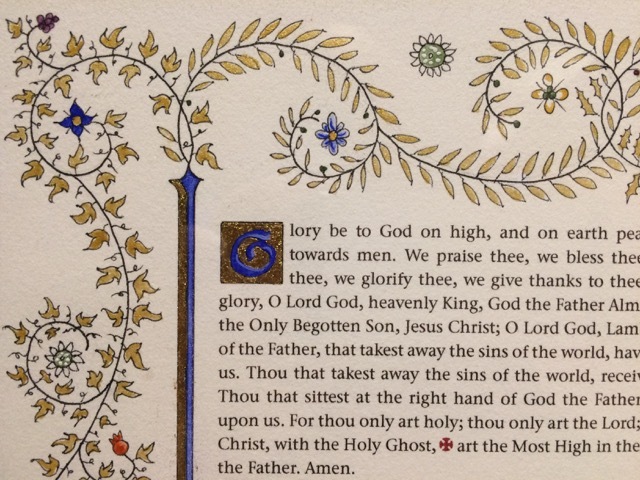 Another example of this is a newly designed handmade set of altar cards, by DC-based artist Katherine Quan [http://www.designqstudio.com/bradley-central-card]. 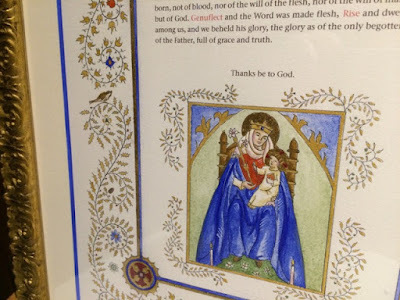 The cards seek to reflect the medieval illuminated manuscript tradition of the 13th and 14th centuries, while also acknowledging the artistic heritage and ongoing life of the personal ordinariates. 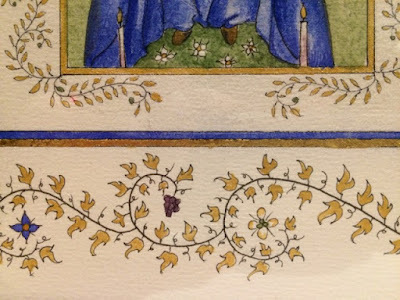 Painted with egg tempera and natural pigments, gold gouache was added for the leaves that decorate the cards, and 23k gold was used for the halos, outer frames, letters, and central crucifix. To create this effect the artist boiled down a bottle of stout for six hours, until it condensed into a molasses-like consistency, and then painted it onto the cards. 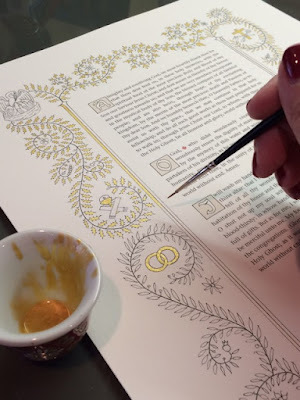 The next day she breathed onto the beer-based glue, warming it up in order to allow the direct application of the gold leaf. Each element of cards has symbolic meaning. 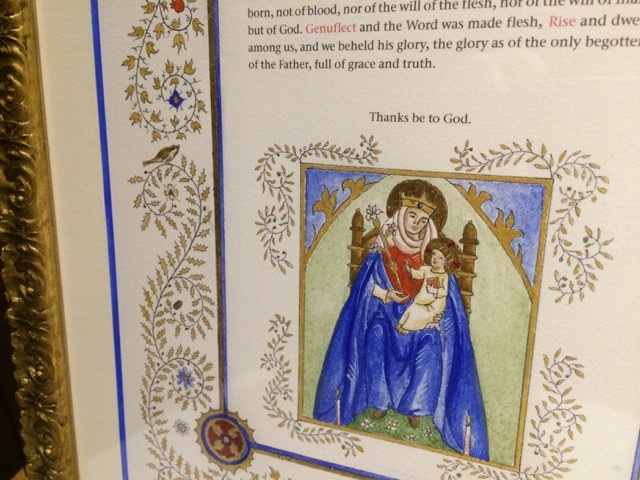 The focal point of the central card is obviously the crucifix, based on the 13th century Weingarten Missal. 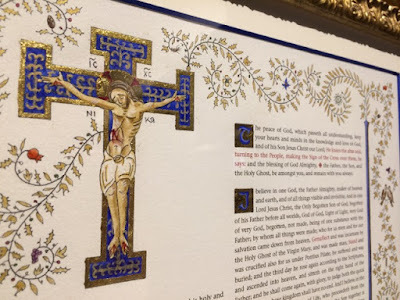 The crucified Christ, whose halo is reminiscent of the work of Martin Travers (whose own work adorns the pages of Divine Worship: The Missal), is the source of all things, and it is from his sacrifice that the life of the Church flows. 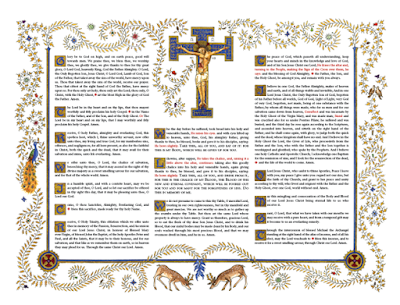 Thus from his wounded side comes the first of twenty-four branches, which each represent one of the Ritual Churches in communion with the See of Peter. These, in turn, are made of three trees: the olive (Ps. 52:8), the sycamore fig (Song of Songs 2:13; John 1:48), and the holly (the symbol of the crown of the thorns). 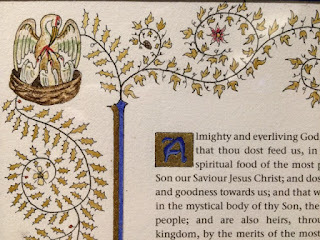 The olive leaf has single point representing the unity of the Godhead, the sycamore fig has three points representing the Most Holy Trinity, and the holly has seven points representing not only the passion of Christ but also, drawing on the heraldic tradition, truth, the guiding principle of the journey of former Anglicans into the Catholic Church. Each of these branches is also decorated with flora, many drawn from Sacred Scripture. These are, the Crown Flower (Rev. 12:1); lily (Song of Songs 2:1, Hos. 14:5, Matt. 6:28); mustard blossom (Matt. 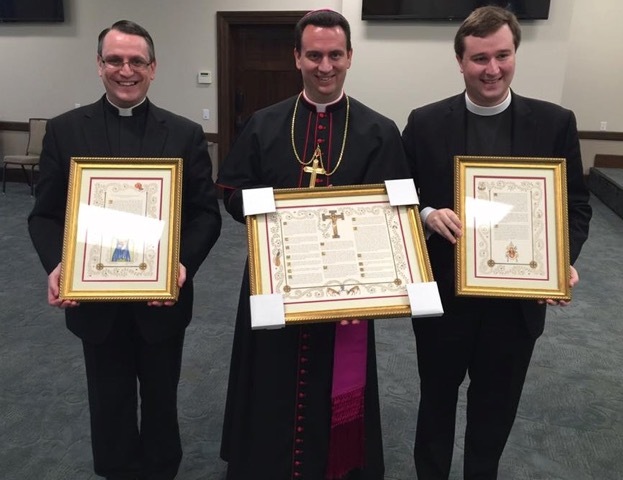 13:32); violet (the humility of Our Lady); myrtle blossom (Isa. 41:19, 55:13); pomegranate (Deut. 8:8; Song of Songs 4:3; Hag. 2:19); grapes (John 2:11; 15:1); wheat (John 12:24); fig (Deut. 8:8; Luke 21:29); cedar of Lebanon (Ps. 92:12; Hos. 14:5-6, Song of Songs 15:5). At the corners of the frame of the central card we also find two red crosses, based on the cross of Saint Augustine (itself a Roman-style cross), which not only reflects the English Anglican patrimony of the personal ordinariates, but act as a reminder of the Roman origins of English Christianity: Pope Gregory the Great sent Saint Augustine to England, and it is to the propagation of that same faith that members of the ordinariates have pledged themselves. Three animals are also found on this card. On the left hand side we find a peacock, the symbol of the resurrection and eternal life, who rests near the first of the offertory prayers. 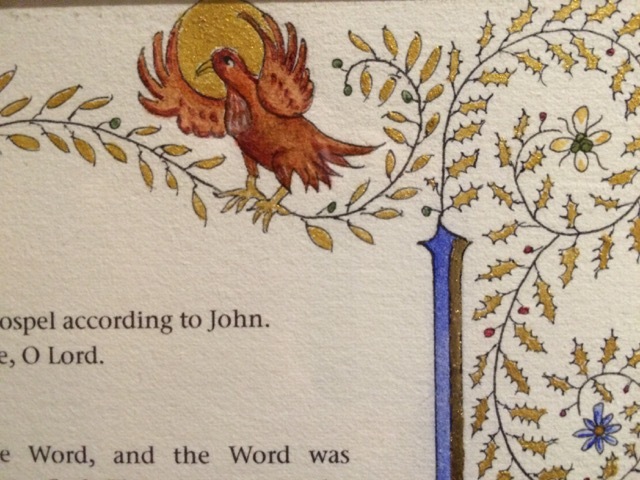 On the right hand side we find two turtle doves (Song of Songs 2:12; Luke 2:24), representing sacrifice, and also a reminder of the date of the consecration of the first ordinariate bishop, the Feast of the Presentation of the Lord. The large number of birds in the branches also remind us of Matthew 13:32: “Which indeed is the least of all seeds: but when it is grown, it is the greatest among herbs, and becometh a tree, so that the birds of the air come and lodge in the branches thereof.” This is a thought close to the hearts of the nascent ordinariates, their clergy and people. At the base of the central card, seen to be waiting for water to fall from the branches of the Church, are two deer, or hart (Ps. 42:1). 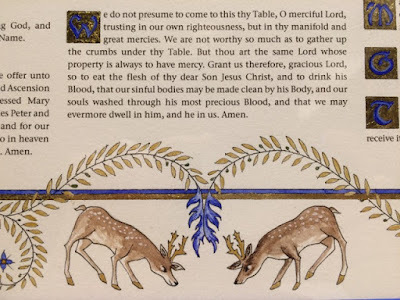 These are not only common in the artwork of the liturgical movement, but are also mentioned in Psalm 42 which is recited before the Priest ascends the altar. 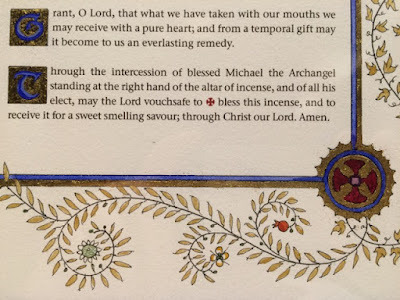 Thus, at the bottom of the card, they are the first thing to which the Priest will come as he arrives at the altar, to venerate it with a kiss. They also offer a play on words, referring to the motto Blessed John Henry Newman, Cor ad cor loquitur—Heart speaks unto heart—and thus provide a connection with that most famous of Anglican converts, and the secondary patron of the Personal Ordinariate of Our Lady of Walsingham. 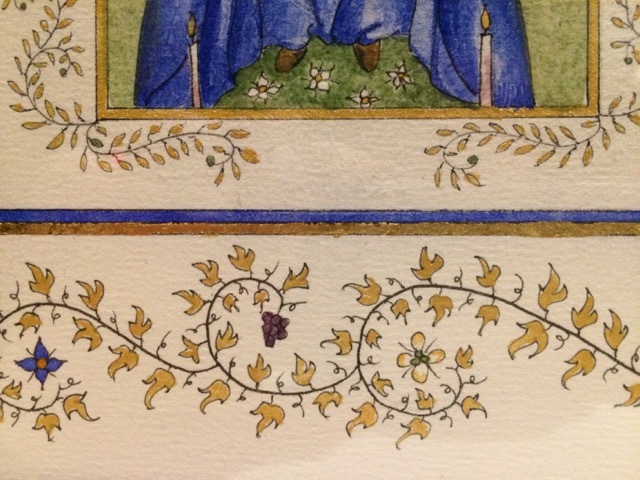 The Last Gospel card has a prominent depiction of Our Lady of Walsingham herself, under whose patronage the personal ordinariate in the United Kingdom was established, and who is the titular patron of the Cathedral Church of the Personal Ordinariate of the Chair of Saint Peter in Houston, Texas, and the secondary patron of the personal ordinariate in the United States and Canada. The image itself is based on the work of Enid Chadwick, whose art adorns the Anglican shrine in Walsingham. This card also depicts two animals. First, the sparrow (Matt. 10:29) and, secondly, the eagle as the sign of Saint John the Evangelist, the author of the traditional Last Gospel. 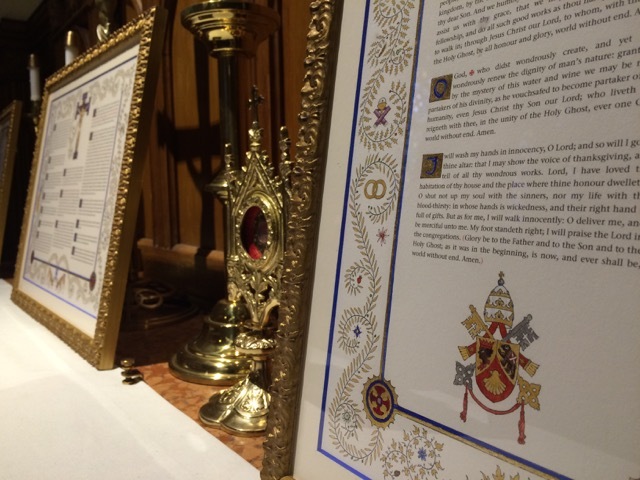 The symbols of the sacraments of initiation are also found here, with Mary who is “full of grace”: baptism, represented by the pilgrims’ shell, confirmation, represented by the Holy Spirit, and the Most Holy Eucharist, represented by the chalice and paten. The Lavabo card is notable for the coat of arms of Pope Benedict XVI, whose 2009 apostolic constitution Anglicanorum cœtibus established the personal ordinariates. By the Prayer of Thanksgiving, drawn from the Book of Common Prayer, we find the pelican in her piety representing charity and the Most Holy Eucharist. On the right of the card, an owl represents wisdom. The sacraments of Holy Orders (first) and Holy Matrimony (secondarily) are found to the left of the card, and those of Penance and Extreme Unction are found to the right. 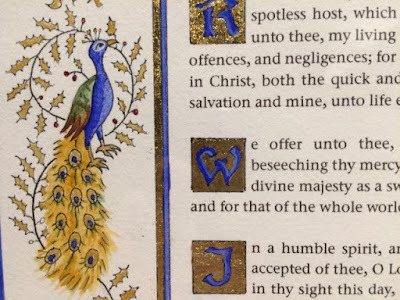 There is an obvious pattern between the sacrifice and charity of the pelican, and ordination and marriage; and between penance and anointing, and the owl of wisdom.